The Jedi High Council: the ruling body of the Jedi Order for millennia until the Order’s downfall at the end of the Clone Wars. Consisting of twelve Masters, these experienced and wizened Jedi deliberated the best direction and course of action for the Order they were tasked with leading. At the head of the Council was a Grand Master, and during the last years of the Old Republic – years we see unfolding in the Prequel Trilogy, The Clone Wars animated show, and through other storytelling mediums – that title/role was occupied by Yoda, the mysterious Jedi introduced in The Empire Strikes Back. But while Yoda may have been the oldest and wisest of the Jedi, commanding infinite respect, and his opinions on Jedi matters carrying incredible weight, he was surrounded by Masters gifted in their own particular ways. It is at this point, though, that I must acknowledge my intention for this post. Rather than trying to weave a path towards my conclusion, highlighting all of the Masters and the way their stories have been woven into the fabric of Star Wars, it is far easier to be direct. In short, this piece is titled “Women of the Jedi Council” because, upon reflection, I found myself shocked that there are not MORE women on the Council. While we do hear women who sit on the Jedi Council speak in The Clone Wars animated series (Adi Gallia and Shaak Ti), a woman NEVER speaks during a Council session in any of the three Prequel films. Notably, the only Jedi woman who speaks in the Prequels is the Jedi Archive librarian Jocasta Nu, but she is not a member of the Council. A woman NEVER replaces a man on the Jedi Council. In fact, the opposite is true, with Coleman Kcaj replacing Depa Billaba. More men (6) are added to the Council over those 13 years than the total number of women (5) who sit on the Council over that same period. Well, first and foremost, I will return to my initial admittance: as I reflected on the Jedi Council I was shocked that women are so underrepresented, and I am guilty for not recognizing this sooner. While I was growing up when the Prequel Trilogy films came out (the years 1999, 2002, 2005), and was not prone to deeper reflections on the franchise I loved at that time, as an adult I can say I am disappointed in myself for not recognizing this woeful disparity and lack of female voices sooner. Better late than never, though. …what does this imbalance of the sexes say about the Jedi Council? In some respects, I suppose it isn’t all that surprising. If art imitates life, then the Jedi Council imitates many corporate board rooms where men still outnumber women. Or, since the Jedi are a religious order, we can think of religions around the world which place greater emphasis on the voices/actions of men (the hierarchy of the Catholic Church being one example). But just because it isn’t surprising that the Jedi are governed predominantly by men doesn’t mean it isn’t disappointing. The Jedi Order is supposed to be built around principles of egalitarianism and, as such, one would presume that the High Council would strive for a balance of the sexes. In fact, I cannot help but wonder: if more women – and newer voices in general – had been present, would they have stopped the march to war in Attack of the Clones which was led by the Council’s longstanding (male) Masters, Yoda and Mace Windu in particular? Iranian-born actress Shoreh Aghdashloo as Chrisjen Avasarala in The Expanse. This is certainly not the only question one could ask, and there are any number of answers that are possible. Yet, my intention is not to dig into every single question, or find every answer. Instead, in presenting what I believe is a truly unfortunate reality about the make-up of the Jedi High Council, the lack of women and their voices on that Council, I want to end with a suggestion. As the Star Wars franchise moves forward, with more films being added over time, my hope is that if a film is set in the days of the Old Republic, long before the events of the Prequel Trilogy, that the Jedi Council (if included in the film) feature a perfect distribution of 6 women and 6 men. To this, I would add my desire that the Grand Master of the Jedi Council also be a woman. If left to me, the actress I’d place in the Grand Master’s seat would be Iranian-born actress Shohreh Aghdashloo, a woman with an incredibly commanding presence in SyFy’s show The Expanse. I am of the opinion that Aghdashloo is a natural fit for the Star Wars universe, and could be a remarkable Jedi Grand Master if given the opportunity. That said, there are many actresses who’d make great Jedi Masters if given the chance, and I hope the day it is not far off when we see them on the High Council and helping to lead the Jedi Order. Since writing my post on The Funeral of Padmé Amidala a while back, Padmé has continued to pop into my brain from time to time. But recently, it has been more than sporadic episodes – I’ve just not been able to stop thinking about her. This hardly means I haven’t been contemplating other awesome Star Warsie things, but for some reason my brain would just loop things back to her. Admittedly, it was a bit perplexing, but don’t take that to mean I dislike thinking about Padmé because I think she totally rocks. It’s just that lately she has been taking over my brain waves more than usual and I couldn’t figure out why. Well, I couldn’t figure out why until just the other day when I was sitting on the couch and realized that Padmé is nowhere to be found these days. Sure, she lives on vicariously through Leia (and perhaps Rey? ), but otherwise, Padmé feels like a distant memory, having been relegated to the sidelines of the Star Wars universe. In fact, the more I’ve thought about it, the more I have come to realize that Padmé is getting shafted. Consider this – as of right now, the stories of the main characters from both the Original and Prequel Trilogies are being continued with the obvious exclusion of Padmé. How and why did she become the Queen of Naboo at such a young age? As the Queen of Naboo, how did she handle the aftermath of the Trade Federation’s invasion? Did she have regrets about how she had handled the crisis, about trying and failing to keep Naboo out of a war? What was her relationship like with Palpatine in the years between The Phantom Menace and Attack of the Clones? Were there other attempts on her life, similar to the one we see at the beginning of Attack of the Clones? How did she and Anakin navigate their secret marriage, particularly early on in the weeks after they wed? Did she ever confide in anyone close to her (like Dormé) that she was married to Anakin? 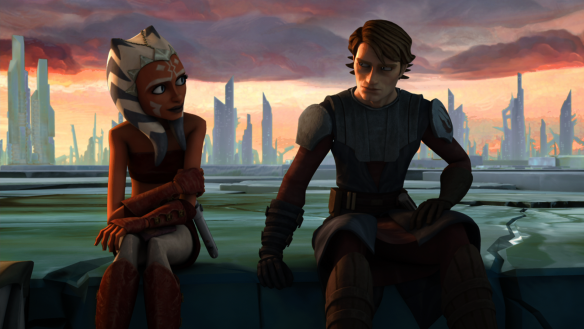 Besides the adventures we see her go on in The Clone Wars, did she have any others? What was her feelings/reaction to the discovery that she was pregnant? How did she explain her pregnancy to the people around her (i.e. – other Senators, her family)? Padmé sits with her handmaiden Dormé. At the very least, Padmé deserves her own Five-Part Comic Series. While I would absolutely love to see Natalie Portman reprise her role as Padmé on the big screen, I am also realistic in knowing she most likely never will unless it is a very minor cameo. In lieu of a film, I really believe Padmé would be a great character for a comic series, even a short one. This is precisely what we saw with the Princess Leia comic, a short, five-part series that allowed us to view Leia in her element, being a leader who isn’t afraid to make decisions and put her life in danger for the greater good. I see no reason why the same couldn’t also be true of Padmé. Heck, it already is true of Padmé, as we’ve seen her time and again step up as a leader, taking charge of situations, putting her life on the line, and doing her duty for the benefit of others. A comic series would be a way to not only add a new layer to Padmé’s story, but could serve as a way to dynamically expand upon her great qualities. But one of the other important things about the Princess Leia comic is that while we see Leia take the mantle of leadership, we do so while also getting into her mind. This was particularly important for the series as it takes place in the days/weeks after the destruction of Alderaan and the events of A New Hope. As such, we see first hand that she is struggling with the destruction of her homeworld and family, all of which helped to motivate Leia, as the last royal of her planet, to track down and safeguard any remaining Alderaanians. Padmé tells Anakin that she is pregnant. I wonder what she was thinking before/during/after she told him? I believe the same mix of external and internal would be perfect for Padmé as well. Depending on when/where it took place, the series could serve as a way for us to enter into Padmé’s mind, to really experience her motivations, feelings, and struggles. Padmé would certainly get to shine as the story unfolds, and I hardly think the series should be a case study in the psychology of Padme Amidala, but it would be fascinating to get a more personal glimpse of her thoughts. But only a glimpse – even fictional characters should be allowed their privacy. Lastly, as a final thought, I should mention that I think Padmé deserves to be the center of attention for a rather simple reason – there are far too many male characters dominating the Star Wars landscape. While I love that there’s an Obi-Wan & Anakin comic series, and that Poe Dameron will be the center of attention in an upcoming series, I can’t help but wonder why Princess Leia is the only female character who has received her own comic run. Well, that could easily be changed with a step in the right direction if Padmé Amidala were given a chance to standout in a series of her own. Remember that moment in Revenge of the Sith when Anakin is given a seat on the Jedi Council but Mace Windu tells him he IS NOT granted the rank of Master? Young Skywalker is pretty ticked about not being elevated to Master, and voices his disgust vehemently only to be chastised for his outburst. Anakin takes his seat and the scene moves along. Anakin learns that he has been placed on the Council but was not promoted to the rank of Master. I can’t really argue one way or the other if it was the right decision for the Council to deny Anakin a promotion. I could, of course, spend this entire post dissecting the decision of the Jedi Council, and Anakin’s reaction, but my interest in doing so isn’t very high, at least not at the moment. Instead, I want to spend my time in this post wrestling with a different moment, or rather, a different transition point, in Anakin’s life as a Jedi. Basically, I want to know when and why he was promoted from Padawan to Knight because there is no canonical reference to it and, frankly, I want to know what the event/moment was like for Anakin. While this list could definitely be expanded, again, what has no possibility of being added right now is the moment Anakin becomes a Jedi Knight. Of course, some might suggest that this event needn’t be developed, that we get to see him as a Knight in The Clone Wars and Revenge of the Sith. Shouldn’t that be enough? Well, this is true. But we should also keep in mind that becoming a Jedi Knight is not a trivial thing. A Padawan must go through the “Trials,” the ritual process within the Order whereby a Padawan becomes a Knight. While there are a number of significant moments for a Jedi youngling in their training, from the creation to their lightsaber to their being apprenticed to a Jedi Knight or Master, the “Trials” are THE most significant rite of passage one will ever undertake within the Order because it is what makes one a full- fledged Jedi. While the responsibility of the Padawan is to learn the tenants of the Order, to learn how to follow the Jedi Code, this responsibility flips when one becomes a Knight. The Jedi Knight is a full Jedi because they are no longer tasked with learning, but with practicing and implementing the Code. In turn, the Knight will also take on a Padawan of their own, teaching the beliefs and duties of the Order to a young, up and coming Jedi. But it is also worth noting that it is the Jedi Council which decides when a Padawan is ready for the “Trials,” and also determines when/if the Padawan has passed. Only then, if they have passed, will the Council confer the rank of Knight upon the Padawan. In my mind, this is an event in Anakin’s life that is not simply about his taking and passing a test. Or, to say it another way, I am not interested in this particular story just to be able to say Anakin’s “Trials” were X, Y, and Z. Oh no, I want this story because it opens up a wealth of possibilities to get into Anakin’s head, to see how, during this immensely important period of his life, he viewed himself and his relationship to those around him. Now, it is worth nothing the possibility that Anakin was granted his Knighthood immediately following the events depicted in Attack of the Clones. In The Phantom Menace, Obi-Wan is promoted to Knight after his own Master dies, and he defeats Darth Maul in battle. Perhaps the Jedi Council felt that young Skywalker’s actions, such as protecting Padmé, trying to rescue Obi-Wan, and facing Count Dooku, were ample reason to promote him to Jedi Knight. If this is the case, that is all well and good, but I also think it would be a mistake to think the Council promoted Anakin in the wake of all of these deeds. 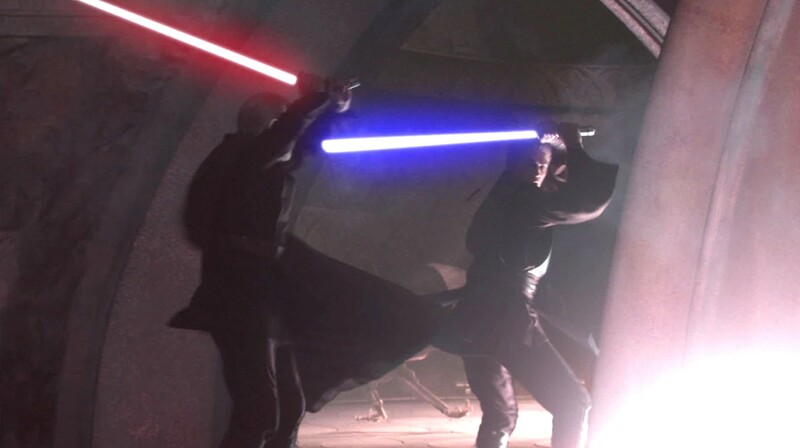 The way I see it, if Anakin is elevated to Knight immediately after, and as a result of, his actions in Attack of the Clones, this shuts the door on Anakin having one more reason to be mad at the Jedi Council, one more reason to complain to Padmé, one more reason for Palpatine to plant the seed of Jedi greatness into his young mind. Of course Anakin would eventually end up facing the “Trials,” but there would be an underlying and persistent resentment, a boiling anger directed towards the Council, and even Obi-Wan, for holding him back yet again, a disgust for being treated like all of the other Padawan’s when he is convinced he exceeds them and most other Jedi. And added to this resentment and disgust would be the ultimate Anakin paradox: that in feeling he should be promoted to full-fledged Jedi Knight, Anakin would also be wrestling with all the ways he has broken the Jedi Code – from killing an entire tribe of Tusken Raiders out of anger to secretly marrying Padmé Amidala. In other words, this story should not be told just so we can see Anakin get upset and pissy once again, but rather to dig into Anakin’s inner-self at a deeper level, to better understand how he reconciles his actions, thoughts, and beliefs with the Jedi Order he is sworn to serve. Besides, it is in the heart and mind of a Jedi where the “Trials” truly take place and, well, after the things he says and does in Attack of the Clones, I want a front row seat to Anakin’s psychological and emotional turmoil as he transitions from Padawan to Knight. Plus, as a side show to the Anakin’s inner action, the story would also give us insight into the way(s) the Jedi Council view Anakin, allowing us to see their hesitation in promoting him and, perhaps, even the decision to provide him with a Padawan after he has become a Knight. I really do hope we get this type of story someday. Leave a comment and let me know what you think. Do you agree there should be a story that looks at Anakin’s “Trials” and, if so, what sort of thing(s) would you want to see in it??? We DO get to see Anakin face the Trials, and receive his promotion, in the non-canonical Clone Wars series from the early 2000s. Happy Father’s Day, Obi-Wan Kenobi!!! On Mother’s Day, I decided to give a shout out to Mother Talzin, the leader of the Nightsisters of Dathomir and mother of Darth Maul. Well, today is Father’s Day and it’s time to honor a father-figure in the Star Wars galaxy. No, I think someone else in the Star Wars universe is a bit more deserving of today’s honor. That someone is Obi-Wan Kenobi. Now, I know what you are saying: “But Mr. Imperial Talker sir, Obi-Wan Kenobi had no children of his own.” Yes, well, that is true and all, but then again, biological fatherhood is hardly the only form of fatherhood. Besides, if the standard for fatherhood is just biology, then Vader set a REALLY low bar for being a good father. No, Obi-Wan may not have had any children of his own, but he still exhibited a number of the positive traits expected of a father-figure. And while Obi-Wan may have been “overly critical” and “never listened” to Anakin, Kenobi was still “the closest thing to a father” Anakin ever had. 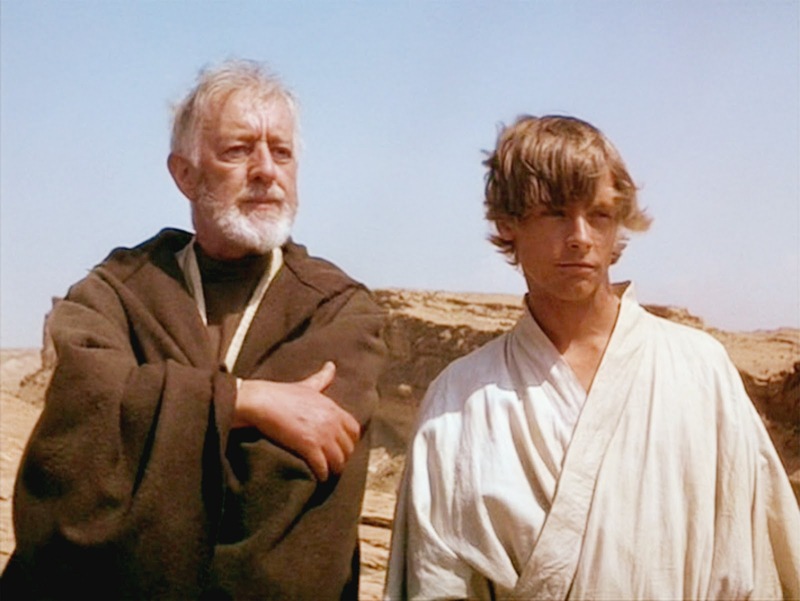 In fact, it is worth mentioning that while Obi-Wan was father to Anakin, he was also, by both extension and action, the grandfather to Luke. So sure, there are lots of fathers and father-figures in the Star Wars universe that we could praise today, and in the future I will give them some love, but I believe Obi-Wan is the most fatherly of them all. Happy Father’s Day, Obi-Wan Kenobi!